Greetings from the home of Etch! We have added many songs from our past to the SoundCloud player. These songs were not released on our albums. Enjoy! Our albums are available online at all the major outlets (CD BABY, iTunes, AMAZON etc.). Having enlisted the world-class production of Scottish producer Ian Miller, " 6 1/2 Hour Drive," Etch's second album, is the result of a two-year journey into the heart and soul of a band. This is the album we've wanted to put out all these years, says guitarist and songwriter Al Ancil Palacio. What makes this an exciting band to watch is the hard-hitting melodies, inspired performances, electronic textures, and diverse songwriting that elicit comparisons with Brit artists such as Muse, Coldplay, New Order, and Peter Gabriel. The first thing that strikes you about Etch is their sheer musical diversity in songs that blur the line between alternative electronic-rock Down The Road, subtle calypso groove-laden pop This Time, bass-driven angst I Feel It, Floyd-esq psychedelia Follow Me, a poignant introspective ballad (featuring piano, strings, and nylon string guitar) Everything So Clear, and a cinematic wall of sound in Let It Lie, all while maintaining their unique vision. Vocalist and songwriter Scott Bottomley's charismatic style and tone reminiscent of the Brit pop invasion of the '80s leads this unique but all American band. "I enjoy the process of seeing a musical idea take shape into a song; the blending of different textures and sounds, different instruments creating a sonic mood. In the end, I like taking the listener on a small journey for a few minutes in time"
Steampunk-inspired guitarist Ancil's versatility and range straddles the line from the texture and minimalism class of guitar players the likes of ex-Smith's guitarist Johnny Marr, U2's The Edge, to the soaring soulful melodic lines of Journey's Neal Schon to Slash. "I love all things guitar! To me, using a myriad of effects, amp tones, and various types of guitars to create sounds that fit the song are equivalent to what a painter would use in his palette of colors. These are tools I use in creating our art". Drummer Jeff Siciliani puts the stamp and groove to the Etch sound and completes the band. 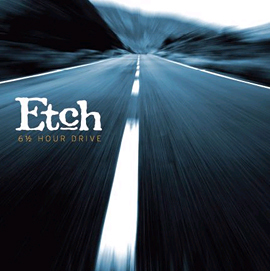 Etch was formed in Orange County, CA by Scott Bottomley, Al Ancil Palacio, and Jeff Siciliani.